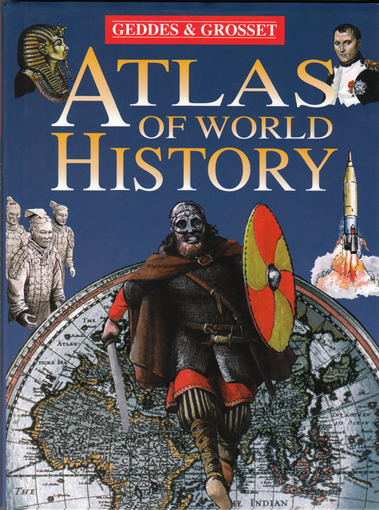 Description: Evocatively illustrated atlas showing the major movements and events that have transformed the world. Beginning with the early environment and lifestyle of the first human settlers – via the ancient and mediaeval world – and concluding with the Industrial Revolution, early and mid 20th Century, and finally the present day (in this case 1997). Also contains a comprehensive timeline detailing world events across 5 continents (Europe; The Americas; Asia; Africa) from 20,000 BC through 1997 AD. Excellent full-colour illustrations and detailed maps. The jacket has some minor rubbing along the board edges and light scuffing along the top, but is otherwise fine. The book itself is in excellent condition: straight, undamaged boards and crisp, bright, unmarked pages. Measures 26.5 cm × 19.5 cm (10.6″ × 7.8″). 4to. 142 pp.